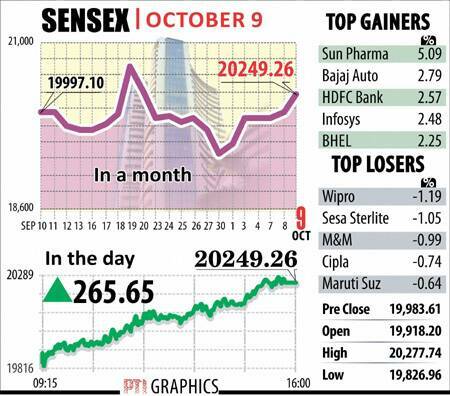 After lower start at 19,826.96,the Sensex recovered to hit the day's high of 20271.72. Paring initial losses,the BSE Sensex today rose over 265 points to close above the 20,000 mark for the first time in three weeks on good buying in bluechips led by bank and interest-sensitive stocks,amid trade deficit narrowing to the lowest level in 30 months. After a lower start at 19,826.96,the Sensex recovered to hit the day’s high of 20271.72 and finally closed higher by 265.65 points,or 1.33 per cent at 20,249.26. The gauge ended over 20,000 level for the first time since September 20. 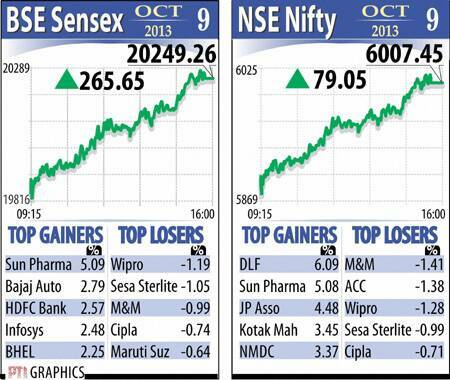 Gains were led by Sun Pharmaceuticals Industries,Bajaj Auto,HDFC Bank and Infosys. Out of the 30 Sensex stocks,25 stocks advanced and five ended with losses. On similar lines,the broad-based NSE nifty regained the crucial 6,000 level and closed higher by 79.05 points,or 1.33 per cent,at 6,007.45,after touching a high of 6,013.70. Also,SX40 index,the flagship index of MCX-SX,gained 151.11 points to end at 12,055.73. Brokers said the trading sentiment bolstered on reports of the September trade deficit narrowed to 30-month low and a mixed trend in the global markets. The exports grew 11.15 per cent in September and imports declined 18.1 per cent amid a sharp fall in inward shipments of gold and silver,taking the trade deficit to the lowest level in 30 months. Sectorally,the realty sector index gained the most by 4.27 per cent to 1,315.39 followed by banking index by 1.88 per cent to 11,770.50.